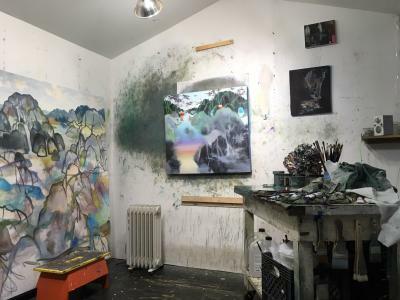 Please join us on Tuesday, April 17 at 5:30 pm for a conversation between artists about what it is like to be in their studios. The artist’s studio has long been regarded as a romantic place of inspiration and creativity. Find out what it is actually like for each of these artists. Listen in on a conversation between them about how each creates a studio, what it feels like to walk in the door (is it heaven or hell or both), and strategies to get into a creative mind space. We are grateful to the artists for sharing what can be a private place and subject.